Without, an intimate exhibition of new works by Matthew Watson and Meleko Mokgosi at WORK Gallery, toys with the definition of its seemingly simple preposition. Usually implying an absence or lack, in its most archaic form it connotes the external. It is there, in the negotiation of topical superficialities with self-identification and cultural expectations, that these two very different artists meet conceptually. In their hands, paint itself becomes a metaphor for experience. Matthew Watson, Untitled Portrait, 2009, oil on copper, 9 x 11 inches. Via WORK Gallery. With aristocratic portraiture as his touchstone, Watson’s images of Brooklyn locals demonstrate a true art historical praxis but with a twist. The Greenpoint immigrant of Untitled Portrait lacked even the basic English skills to share his name or identify himself — really to fulfill even the essential purpose of a portrait. 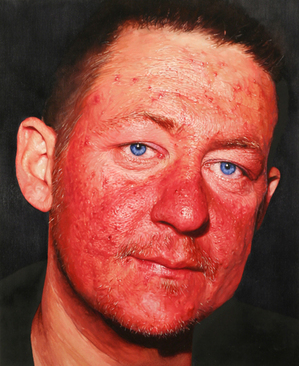 The closely cropped composition and decontextualized background makes the grotesque surface of his splotchy, red face the lone signifier of his identity. Appearing to suffer from the side-effects of heavy alcohol consumption in the form of extreme rosacea and severely damaged capillaries he fulfills the stereotype of a drunken, lethargic immigrant. Steeped in the methods and materials of Old Masters, Watson’s process counters this presumption in subtle ways. Over a period of months, he meticulously layered oil paint mixed with powdered Venetian glass and fir balsams upon a copper plate, an extremely labor-intense medium. Watson’s large investment of time and materials upends the value system of a society that marginalizes its newest members, while the very choice of a marginalized, undervalued subject undercuts the fetishization of the art object.